In addition to our colonoscopy services, Texas C-Step is now offering opportunities for financial assistance with screenings and diagnostics related to breast and cervical cancer. The Texas Cancer Screening, Training, Education and Prevention Program, or Texas C-STEP, is conducted through the Texas A&M Physicians Family Medicine Center. Texas C-STEP provides critical safety-net services, such as cancer screenings and certain advanced diagnostics, to uninsured, underserved and low-income Texans through an established family medicine residency training program. 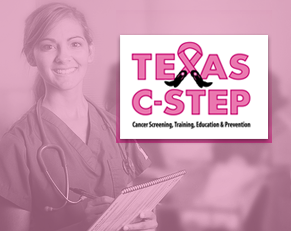 Texas C-STEP is funded by grants from the Cancer Prevention & Research Institute of Texas. The grants provide much needed access to women’s health services and colonoscopy, while also enhancing screening capacity and physician training. The program serves as a state and nationwide model for translating cancer screening services, such as colonoscopy, into the family practice setting. Funding for this prevention and screening project has dramatically increased the availability of various cancer screenings for safety-net patients, while increasing the number of family medicine physicians trained to conduct colonoscopy screenings. Community health workers provide culturally-appropriate outreach, education and navigation services to the patients who receive cancer screenings at the Texas A&M Physicians Family Medicine Center.